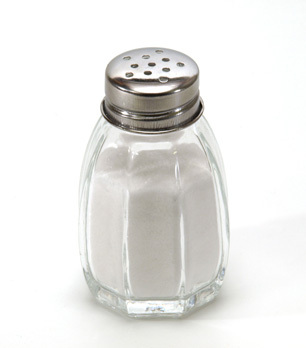 Table salt is composed primarily of sodium chloride (NaCl)—a salt of chloride and sodium ions. Chloride is one of the most prevalent anions found in water, commonly combining with the cations sodium, calcium, and magnesium to form salts. Chlorides have a wide range of uses; they're used in foods, de-icing salts for roads, fertilizers, animal feeds, and chemical manufacturing. Chlorides arrive in surface and ground water both naturally, as from sea water, and as a result of human activity. Chloride levels in most waters range from 10 to 100 mg/l, and sea water contains over 30,000 mg/l of sodium chloride. Chloride levels may increase with water treatment involving chlorine or chloride. Chloride is an essential electrolyte that helps to maintain pH, transmit nerve impulses and regulate cellular fluids. A typical person has about 81.7g of chloride their body. Excessive chloride (above 250mg/L) can make drinking water taste salty. When concentrated, chloride can cause corrosion of metal piping. Iron is leached into water from metal pipes when high levels of chloride are present. Chloride is the main cause of pitting of stainless steel. Chloride combines with hydrogen to produce hydrochloric acid. Reverse osmosis removes around 95% of chloride, and electrodialysis and distillation are also effective. In industrial settings, strong base anion exchangers can be used. Because of chloride's corrosive effects, when treating water high in chloride, plastic is usually preferred to stainless steel for reverse osmosis membrane housings.